This weekend’s episode of Doctor Who revealed a strange new twist in the Doctor and Missy’s tumultuous relationship. 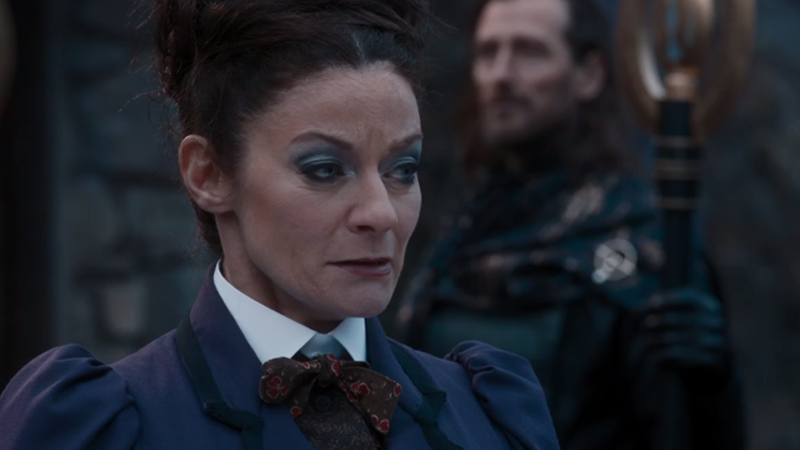 We recently had the chance to talk to Michelle Gomez about her time on the show, and now that “Extremis” is out in the wild, we had to get her spoilery thoughts on Missy’s latest appearance. So when Missy gets out—which, considering Gomez has already teased us with scenes she’ll be sharing with returning Master John Simm later this season, is practically a foregone conclusion at this point—don’t expect any more pleas of friendship with her oldest foe, or even Mexican takeout and shared tales of monsters eating people, as we’ve seen the Doctor offer in past episodes this season. The next time we’ll see Missy, it’ll be her on the look out for revenge at her imprisonment... and maybe even her wardens. Doctor Who airs on BBC America Saturdays at 9/8 Central.